The film features interviews with the criminals - active dealers, ex-dealers in Ibiza Prison, and substantial undercover filming with dealers at work. In some bars, Class A drugs like MDMA, cocaine or 'crystal meth' can be bought over the counter as part of the "drinks promotions" offered to holiday punters. Drugland accompanies the undercover anti-narcotics police as they bust British gangs from Liverpool and Manchester - fighting for turf with other groups of dealers from Spain and beyond. 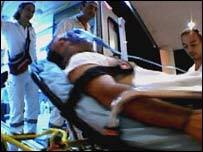 Paramedics are filmed as they try to cope with those who collapse from exhaustion and dehydration brought on by clubbing and drugs. Some even die during filming - the true cost of the paradise that so many seek here. Drugland: Ibiza was broadcast on Thursday, 6 January, 2004 at 2100 GMT on BBC Two.